Anti-Fatigue Mats - 24" x 60"
Supermat 18M - Anti-Fatigue Mats - 24" x 60"
Reduce work-related aches and pains by up to 50% with these closed-cell vinyl floor mats. These sure-grip ribbed foam mats insulate against heat and cold, while providing a 3/8" thick cushion. Beveled edges minimize tripping. Black. 3.5 stars I'd say. I got these on sale, price was ok but shipping was a bit much, each gets it's own shipping charge and comes in it's own box, unavoidable I guess. Anyway, they are not the same thickness or quality as the professional anti-fatigue mats we have at work, but again, that's fair enough at this price. Ultimately I am happy with them, I put one in front of my lathe and one in front of my mill and I do feel that they offer a more pleasant standing experience. One advantage is that they are not so thick as the professional ones, therfore less tall and less of a stumble-hazard. They are wider than the mats you can get at home stores that are aimed at putting in front of the kitchen sink. Bottom line- if you are a professional business using these 24/7, get the real stuff and pay for it. If you are a light-duty user like me, only spending a few hours at most per week in front of your hobby machines, this is likely more than adequate. I picked up this item while it was on sale. After using the mat in my workshop, I cant believe I hadnt purchased one sooner. It really helps reduce fatigue during long periods of standing in front of my workbench. Thought these would be too thin. I was wrong. No tripping, and the change in my 'back' comfort was dramatic. At first, I was skeptical whether this would work or not but with a few weeks experience I'm starting to believe it does. With a decrease in general overall pain from standing too long at workstations I've found it to be beneficial. I cannot attest to long term durability but, I'll simply replace it if it wears away because I like it that much. Excellent product! Protects the feet, knees & legs & even tools & other items that may fall on it. Gives a better chance of avoiding damage when fallen on. I bought several for work & home, good size too! I couldn't be happier with this high quality product! And it's made in the U.S.A.! Better than the plywood I was using. Would be better if it were wider. Works very well and you can feel the difference standing on it. This mat works very well as I use it in front of a workbench on a daily 8 hour shift. Great price on a quality item, and would recommend this to someone having to stand in the same area for long periods of time. I'm so happy with it that I ordered more for both my workshop and the kitchen. Good quality as a reasonable price. I bought these for my workshop/laundry area where I had old carpet runners. These looked like crap and were not comfortable. These look 100% better and are pleasant to stand on. They also vacuum in a snap and don't move around under my feet. I will order another for my workbench area. Standing on concrete is not helpful to anyone with a sore back or feet. I spotted these mats on sale and ordered them right away. 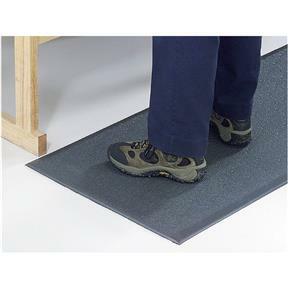 The cushy mats help prevent the nagging pain from standing in one spot for long periods of time. Do your body a favor and get floor mats. These are heavy enough that they don't blow around and you can sweep them off easily. Purchased 5 of these to lay around my work table, they work well . Well worth the price compared to other brands. There are many other mats that are much easier on the legs, but the price on this may make it worth while for some locations. I love my Anti-Fatigue Mats. They are so soft and look great. WE'VE BEEN USING THESE MATS FOR THE PAST 6 MONTHS AND COULD NOT PASS UP THIS SALE FOR BAUCK-UPS . THESE ARE VERY REASONABLE FOR THE QUALITY AT THE RETAIL PRICE . Actually, we ought two items from Grizzly. The mats were well packaged and shipped promptly as well as the Grizzly tenoning jig that my son purchased for me for Christmas. The jig was sent directly to me and was well packaged and arrived in a timely manner. I bought this to put in front of my bench to save tools falling to the floor. It's of good size and thickness to do the job. I have one by my lathe, and it makes all the difference. So much so that I got one for the kitchen for when I do dishes. It is very good quality and heavy duty for sure. I will buy more. Better than expected. Great Price.